Geometry: Standing on my shins, my feet and shins are parallel. My thighs are perpendicular to the floor. My chest stretches backwards and my arms are stretched straight with the hands on the heels (or palms on the soles of the feet). Kneel on the blanket with the knees and feet hip width apart. Check that the shinbones are parallel and the toes point straight back. Sit in Vajrasana to press the shins down. Then kneel up again. Have the hands on the hips. Press the buttocks down towards the floor and forward. Keep the thighs perpendicular to the ground and lengthen the entire front body up. Keep the chest well lifted as you curve the trunk backwards. Take the hands onto the heels behind you. Press the hands to lift the chest. Keep the neck long, and take the head back. Take the hands on the waist and bring the trunk to an upright position. Sit in Vajrasana. Remember the actions in the legs. teach more about the base of the pose. outer hips down and inner thighs up. 1. Lengthen the shins. Press the tops of the feet and lengthen and press the toes. 2. Lift the sides of the waist. Lift the armpit chest. Shoulder blades into the back. Broaden across the collar bones. 4. Press the hands down to lift the chest. 1. Roll the front thighs in and stretch the thighs up. Extend from the outer hip to the outer knee to firm the hips over the thighs. 2. Tuck the buttocks in. Move the sacrum forward to extend the thighs, buttocks and the hips. 3. Externally rotate the upper arms. Take the outer shoulders back and broaden the collarbones. Take the shoulder blades into the back to lift the chest. Broaden the ribs and lift the armpit chest. 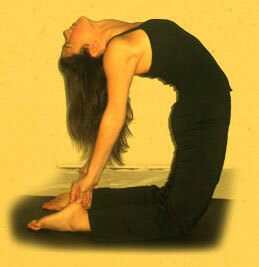 Move the spine in between the shoulder blades and raise the sternum. 4.Use the hands to lift the chest further by moving the shoulder blades in and pressing the hands down to lift the chest. Learn to bend backward while keeping control over the legs. Learn to keep the shins pressed down in order to lift the thighs and spine. Do not distort the legs for the sake of bending. If you cannot take the hands down and up together, then until you can learn this, make this movement with one hand at a time. Place a block between the knees for knee pain. Place a block between the feet to straighten the feet. The legs are not parallel. To correct – have the student look at their feet and legs to make sure they are parallel before performing the pose. The feet and tops of the shins do not press down. To Correct – Sit down on the heels and press the shins down. Press the pinky toe side of the foot down. The hips are not lined up over the knees – To correct – press the shins down to lift the hips. Press the middle buttocks forward to lift the hips. Place the hands on a bolster or blocks. The chest is not lifted – To correct – externally rotate the arms to broaden the chest. Press the hands down to lift the chest. Take the shoulder blades into the back to lift the chest. 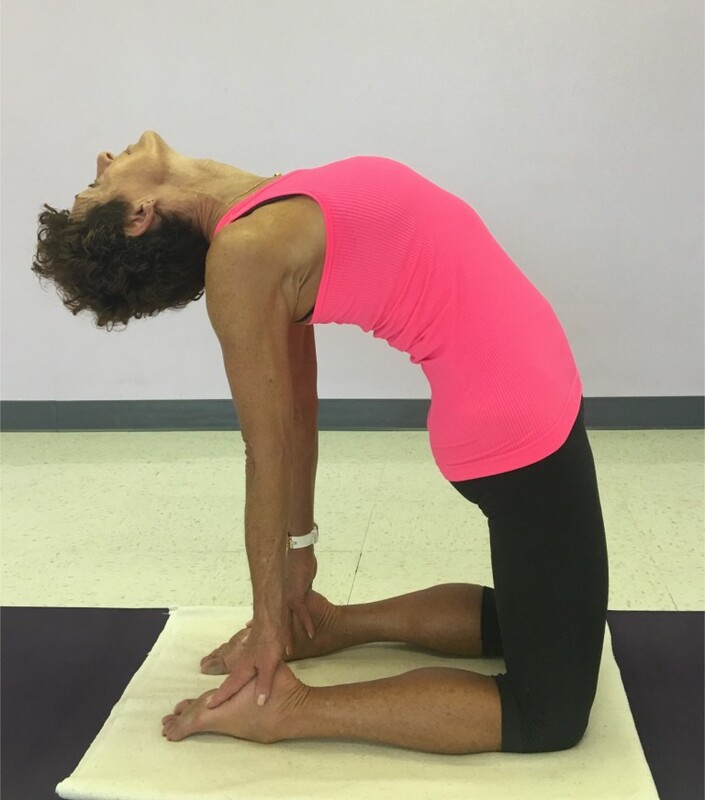 The head is not extended back – To correct – lengthen the back of the neck and extend the head back to rest on the trapezius muscles on the upper back. The arms are not externally rotated - To correct – show the student how to externally rotate the arms before placing them on the feet, bolster or blocks. The hands cannot reach the feet – To correct – show the students how to use a bolster or blocks.